Egyptian president Mohamed Morsi on Sunday received Sudanese counterpart Omar Al-Bashir at the Presidential Palace in Cairo's Heliopolis district, where they agreed to inaugurate an Egypt-Sudan highway and the Sudanese branch of Egypt's National Bank by the end of this week. The Sudanese leader arrived at Cairo International Airport on Sunday afternoon, where he was welcomed by Egyptian Vice-President Mahmoud Mekki. According to presidential spokesman Yasser Ali, the two heads of state agreed at the meeting that the Sudanese branch of the Egyptian National Bank, as well as an Egypt-Sudan highway, would be opened on Thursday during an upcoming visit by Prime Minister Hisham Qandil to Khartoum scheduled for 19 and 20 September. Amnesty International has called on Egypt to withdraw its invitation to Al-Bashir or arrest him when he arrives, in accordance with an arrest warrant issued against the latter by the International Criminal Court in The Hague for his alleged role in crimes against humanity in Sudan’s turbulent western Darfur region. Ali also noted that the Organisation of the African Union was still revising the arrest warrant and that Egypt was committed to its final resolution. Al-Bashir took power in 1989 backed by the Sudanese branch of the Muslim Brotherhood. 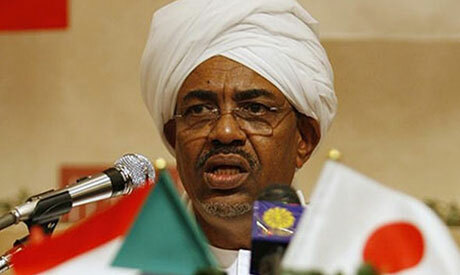 What do you mean by defiantly, who is ordering Morsi not receive Bashir. Amnesty, ICC, and othe joints are tools of the US, Israel, and EU, and whole West. We dont care the BS of these entities. Egypt and Sudan should cooperate in every field, energy, technology, and education. These Western clowns splitted the Africa's biggest country. God will splity their countries into small pieces. when faced by Amnesty, ICC, and the other joint tools of the US, Israel, and the whole West, regarding mistreatement of immediate neighbor: Palestine ..Gaza and Palestinians littles enclaves living in Apartheid, Morsi is timid and mute. The States Parties to the Rome Statute of the International Criminal Court are those sovereign States that have ratified or acceded to the Rome Statute, the treaty that established the International Criminal Court. As of July 2012, 121 states are states parties to the Statute of the Court. Egypt is not one of them and therefore does not have to abide by the arrest warrant issued against President Omar Al Bashir. It is as simple as that. It is even doubtful that Egypt could legally arrest President Omar Al Bashir if it wanted to as long as there are no crimes alleged in Egypt. Ofcourse governments tend to find ways if they want to do something. Consider for example the US federal government investigating now the producer of the anti-Islam movie for parole violations because they can not get him under "freedom of expression" or Al Capone being sentenced for tax evasion rather than other crimes committed. Just a thought.